You’ve paid $225 to come to PTP. For a couple, that’s almost $500 before you even put gas in your car or buy plane tickets. We know that this is a lot of money for many families. PTP Participants go to great lengths to get to Sevierville, and we’d like to let you know where your registration money goes. Our hope is to give a little insight as to why the tuition fee is what it is. The Goal: Just to Break Even. The Reality: Last Year Was a Slight Loss. We’re not in it for the money; we just want as many people to have access to PTP as possible. We do all we can to help those who need to be renewed, refreshed, and recharged to be able to come. Last year we operated at a 3.5% loss—a 103.5% revenue to expenses ratio. Thus, we had to raise the cost a little. No church or individual is profiting from PTP. In fact, many are sacrificing to make it happen. Fund-raising: PTP does not put on fund-raisers or petition churches to cover the expenses of PTP. (In a rare instance when we finished in the red, a few churches were asked to help, and they did.) We don’t have cake sales or car washes to fund PTP. Vending: Vending is when merchants set up booths selling books, clothes, food, and other products to participants during an event. Vendors pay event organizers for the privilege of being there. 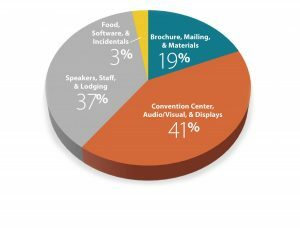 Our vendors pay some to be there, but the revenue does not come close to the cost of their part of Exhibit Hall B. We feel that our participants benefit from having these resources available—especially those from parts of the country without a Christian bookstore close enough to visit. It also provides a way for mission works and other good works to be publicized. While PTP does sell a T-shirt on the registration site, we do not upcharge it. Other items with the PTP logo are handled by Paul Sain. He pays an additional fee to be able to handle these products, but he takes the risk and makes a small profit on these items. We view these as promotional items for PTP. Corporate Sponsors: When you are at an event and you see a corporate name or logo, that company has paid event organizers big bucks for that visibility. The sponsors of Nike Pavilion and Verizon Stage see them as marketing opportunities and those funds come out of their advertising budgets. Although we have been approached many times, PTP has always tried to remove any aspect of commercialization. RVs and Camping: Some festivals charge extra for placement in certain areas or to bring moving vans, trailers, or an RV. To cut costs, we do very little promotional marketing of the event; we don’t pay performers or entertainers, and we don’t build complex and expensive stages (sometimes our A/V partner has decorations he allows us to use at no additional charge)—all significant costs incurred by other events. Even with cost savings, unlike other events, PTP must construct an entire “building” of children’s classrooms in EHB because the Events Center is not designed for an event exactly like PTP. We’d like to shed some light on what it costs to put PTP on every year. The Event Center and Wilderness Hotel are nice properties and do not come cheaply. It also takes a lot of equipment and hours of labor to put everything in place ahead of PTP. PTP offers financial aid (in the form of discounted/free attendance) to widows, missionaries, students, and others who suffer financial hardship, to provide access to the event to those without the financial resources to come. We also provide discounts or scholarships to volunteers who teach, build, or otherwise serve before, during, and after PTP. With 175 speakers from 21 states speaking over 500 times, the travel and honorarium costs are significant. Compare this with a typical church/school of preaching lectureship that has 10 to 25 speakers. University lectureships generally ask speakers (or speakers’ congregations) to pay for their travel/meal expenses. PTP allows about 1,200 children/teens to attend at no charge (with parents). PTP requires 110 children’s teachers and helpers and over 75 staff members to run the week. Many volunteer, but others are unable to attend any PTP sessions (or fewer than half) so they are not required to pay registration, and some are paid an honorarium. Between speakers and staff, PTP pays for just under 1000 hotel rooms. The hotel discounts a small number of these, but the cost to PTP is significant. Our costs are increasing because PTP continues to grow. How Do Our Prices Compare to Other Events/Experiences? To give some perspective, we’ve compared our tuition prices to other comparable events, based on data from 2017. While PTP is indeed an experience unlike any other, it is interesting to compare to other events. Average family vacation: $2862 (according to American Express). Disney World (6 nights for hotel, park passes and food: $3,485 ($871/person).